“I Love My Daddy Week” was full of hard work, laughs, and a lot of love! 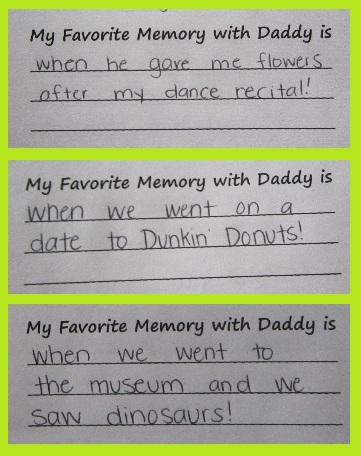 Read on below to learn all about what the students did throughout the week to show their appreciation for their Daddies! In order to prepare the perfect gift for the big celebration on Friday, the students worked diligently throughout the week! The first part of their Father’s Day gift was a personalized I Love Daddy T-Shirt. Read on below to learn about how the shirts were made! By Tuesday, all of the students’ handprints had dried so it was time to “sign” the shirts. Each student wrote their name in chalk on the back of the shirt then the teachers traced over the chalk using puffed fabric paint. Here is how both sides of the shirt turned out. During the afternoon on Tuesday and Wednesday, the students began rehearsing their special Father’s Day song which they would be preforming at the celebration on Friday. 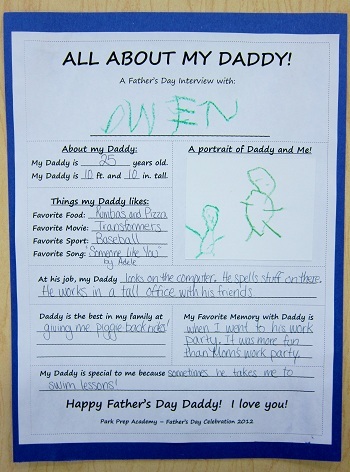 Wednesday was spent creating the second part of the Father’s Day project – A Father’s Day Interview! One by one, each student came and sat with a teacher to discuss Daddy. 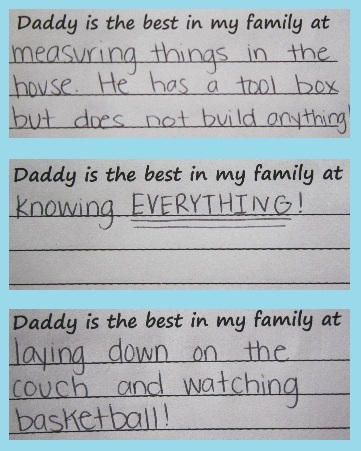 The questions included, “How old is Daddy?”, “How tall is Daddy?”, “What does Daddy do at work?” to name a few. Needless to say, the answers were funny, silly, and certainly adorable! Here are some of the highlights. After answering the questions, the students completed an illustration to add to their interview page. Here is how the completed project turned out! On Thursday, the students completed the final part of the Father’s Day gifts – a page for the class “I Love My Daddy Because … Book”. Below are some of the responses. All that was left to do on Friday morning was wrap up the gifts! The students spent the morning folding their T-shirts into tissue paper and preparing for the big celebration! Before long, the time had come and the Daddies began to arrive for their Ice Cream Sundae-themed Father’s Day Celebration! Like the Mother’s Day Celebration back in May, the Father’s Day Celebration began with a read aloud of the book, “I Love My Daddy Because…”. Needless to say, the story was a huge hit! After hearing the story, the PPA Daddies were treated to a beautiful performance of the “Happy Father’s Day To YOU!” song. The excitement continued to build as the ice cream and various toppings were brought out to the tables. Each table was given assorted toppings including marshmallows, mini chocolate chips, whipped cream, gummy bears, Hersey’s chocolate syrup, waffer sticks, and of course, cherries! The teachers began scooping the ice cream into the students’ and Daddies’ dishes and then the students added the toppings! The Father’s Day sundaes were MASSIVE, topped with toppings, sprinkled, and definitely enjoyed by all! What a sweet day it was! We hope the Park Prep Daddies enjoyed the celebration and their sundaes! Thank you to all the Daddies who were able to attend. You really are the best! Happy Father’s Day! Next week marks the end of the school year. Ceremony begins PROMPTLY at 1:45 p.m. Please arrive early (1:30 p.m.) and allot time for legal street parking. Please click here for all of the photographs from the 2012 PPA Father’s Day Celebration!